The screen shot above shows what happens when you fill in the little text box with information about your disease. The rest is automatically generated. 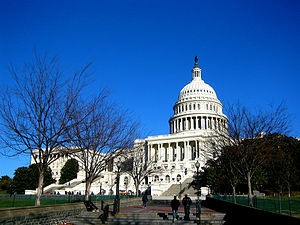 Please take 3 minutes to ask your Member of Congress to join the Rare Disease Caucus at http://bit.ly/RareAlert. It can take up to 10 letters from constituents for a Member to respond so please share this Action Alert with your friends, family, facebook groups, Twitter, blogs & colleagues. 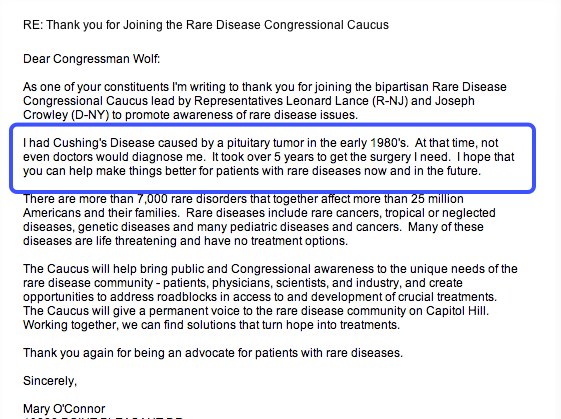 I would like to invite you to join us at the Rare Disease Congressional Caucus briefing scheduled for April 2013. The final date is still being discussed but we are looking into two possible dates of either April 16th or April 18th. The meeting will take place in Washington, D.C. and will be attended by members of the Rare Disease Caucus including co-chairs Rep. Joseph Crowley and Rep. Leonard Lance. As you may know Rare Disease Congressional Caucus is a forum for members of Congress to voice constituent concerns, share ideas, and build support for legislation that will improve the lives of people with rare diseases. The goal of the meeting in April is to educate the members of the Caucus about rare pituitary disorders, including Cushing’s Disease – area that has received little to no recognition among legislators. The meeting will serve as an opportunity to raise legislators’ awareness about multiple issues that patients with rare pituitary diseases, such as Cushing’s disease and Acromegaly, face in their everyday lives. In preparation for the meeting we drafted a Resolution that addresses some of the key challenges for the patient community including long diagnostic delays, limited treatment options, difficulty finding physicians or treatment centers with expertise in their disease and as a result – a diminished quality of life for patients. Would you be willing to have a look at the draft in the attachment and provide your feedback? Your opinion as a leader of the patient community and expert in Cushing’s disease would be highly appreciated. I sincerely hope that you will be able to join us at the meeting to share your perspective and talk about the work that you are doing to help patient afflicted by Cushing’s disease live happier and healthier lives. Please feel free to call or email anytime if you have questions or if you would like to discuss this further. I look forward to hearing back from you soon. Attached to the email was the House of Congress Resolution. Read it here. I got back quite quickly and said that I would love to attend. If it was on the 16th, I could go, no problem. If it was the 18th, probably not because I had plane tickets that day to attend the Magic Foundation Conference in Las Vegas. In late March, I needed to make my final decision on Las Vegas. I had been waffling about that trip for a while since my husband had surprise triple bypass surgery in late January. When I made the decision not to go, he still couldn’t drive or walk the dog – and I was just afraid to leave him alone for 5 days. As it turned out, the date was a non-issue since the Congressional Caucus would be on the 16th. April 15 was a terrible day as news of the Boston Marathon came in. Security was stepped up in several cities, including Washington, DC. I looked online to see if the Caucus would be cancelled and found out that the 16th was Emancipation Day in DC – and the main route that I would take to get there would be closed for a parade. I was already getting very nervous about the whole thing and not knowing how to get there added to the stress levels. I had my talk printed out with 3 different places to stop, depending on the time. We left about 10AM for a noon meeting. I’d decided to park at the train station and take a taxi to the Rayburn House Office Building. When we got to the Rayburn Building, there was a long line of folks waiting to get in. I don’t know if they only open the front door at certain times but when the line started to move, it went fairly quickly. They took 5 at a time through security then we were on our own to find out where to go. It turned out that our meeting room – 318 – is the room usually used for the Ways and Means Committee. We got there just about 11:30. Robert Knutzen from the Pituitary Network Association was already there as was Alexey from Novartis. Alexey said “Mary?” and I said “Alexey?” and we introduced ourselves. I already knew Bob from several past meetings so the four of us just chatted a bit while others started arriving. I had brought quite a few Cushing’s brochures with me and had planned to hand them out to people but Julia from the RDLA (Rare Disease Legislative Advocates) showed me a table where I could leave them for folks to take on their own – and quite a few did. If they read them, that’s another story! Representative Leonard Lance (NJ) spoke a bit about the need to recognize rare diseases in this country. He mentioned that there were 7,000 rare diseases and it was important to focus on getting awareness for patients with them. This Caucus focused on the pituitary, although only 2 pituitary diseases were represented. Novartis created the Rare Disease Franchise was recently created as a means of strengthening their involvement and has two drugs with FDA approvals, one for Cushing’s and one for Acromegaly. Their Acromegaly drug is 25 years old and their newest, Signifor, was approved on the anniversary of the discovery of Cushing’s Disease (December 2012) and three new applications are in the approval pipeline. These diseases are rare because not many people have them and not much knowledge is available about them. He also said he needs collaborative partners, particularly with Cushing’s. He would like to have Clinical Trial centers. However, usually enough patients are near one or two centers. With Cushing’s, there would need to be 40 or more centers. We talked to Vijay after the Caucus about this and connecting his company with Cushing’s patients. Emily Acland, although not a Cushing’s patient, summed up some of the symptoms based on her contacts with patients through the Patient Access Network. Alexey Salamakha, Manager of Rare Disorders for Novartis/Public Affairs and Communications, read some thoughts on the need for disability benefits from Donna of John’s Foundation for Cushing’s Awareness. This included the the fact that veterinarians are more knowledgeable about Cushing’s than endocrinologists. He talked about patient advocacy. Alexey specifically mentioned me and thanked me for my work. Bob Knutzen was not diagnosed until the age of 52. He is currently 75. He expressed his desire to have Centers of Excellence for Hormonal Health with the funds coming from NIH’s budget. Pituitary disease isn’t rare, just the diagnosis. He also pointed out that pituitary patients generally die 10 years early. Without treatment, pituitary patients can’t have children. If I didn’t know what acromegaly was before this meeting, I wouldn’t have known when I left, either. Sean O’Neil, Vice President at Novartis made comments about his company and what was being done to help patients. My contribution to all this was speed of diagnosis. I told a bit of my story, diagnosing myself in the pre-Internet 1980’s and how today, 26 years later, people are still having issues with diagnosis and wasting on average 6-20 years just getting to surgery. I mentioned that I knew a few people who went for 20 years before getting diagnosed. Will anything come of it? I don’t know but maybe some folks will start thinking a bit more. Mary did a great job presenting the Cushings story at the April 16 hearing of the Congressional Caucus on Rare Diseases – Challenges our Country Must Address. Co- chairs Congressman Joe Crowley (D-NY) and Congressman Leonard Lance (R-NJ) both attended and endorsed the good work being done in this effort. Mary spoke with many of the sponsors and others both before and after the hearing discussing her personal experience. Mary has created multiple websites to get the message out on rare diseases especially Cushing’s Syndrome. That effort now extends to more than 40 countries and more than 10,000 participants. We will be doing follow ups with the Congressional Caucus on Rare Diseases and with Novartis, RDLA, EveryLife, Patient Access Network, the Pituitary Network Association and others to build on the gains. It was a pleasure to meet you and Tom today. Thank you for attending the Rare Disease Congressional Briefing. I think you did an excellent job by sharing your unique perspective on what a life with Cushing’s disease is like. I want to thank you for supporting our mission and educating general public about pituitary disorders. We at Novartis strongly believe that patient advocacy organizations such as Cushing’s Help and Support and passionate advocates like you are the future and the hope of the Cushing’s community. As a follow up to our conversation I have reached out to my contacts at NORD and asked if they can help with filing for a 501(c)(3) status. I will keep you posted. Please stay in touch.